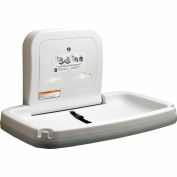 Bradley baby changing station is constructed of polyethylene with brushed 20 gauge stainless steel exterior. Rated to support static load of 250 lbs. Pneumatic gas shock mechanism to ensure smooth, safe open and close motions. 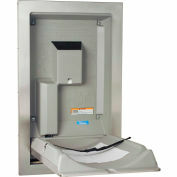 Molded plastic dual liner dispenser holds approximately 50 per dispenser. 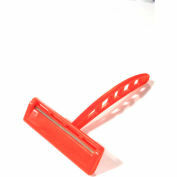 Safety belt with cam-buckle, adjustable with one hand. Surface-Mounted. 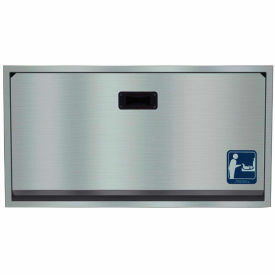 Unit complies with ASTM F2285 Standard that requires commercial diaper changing stations be able to hold a minimum of 100 lbs. Meets relevant sections of the CPSIA to the extent possible.